You may have heard about a drink called Kombucha. It’s a fermented sweet tea, that has been brewed and drunk for centuries. There are store bought versions that are delicious, but you can easily make your own at home. All you need is a SCOBY (symbiotic colony of bacteria and yeast) and some kombucha starter liquid. 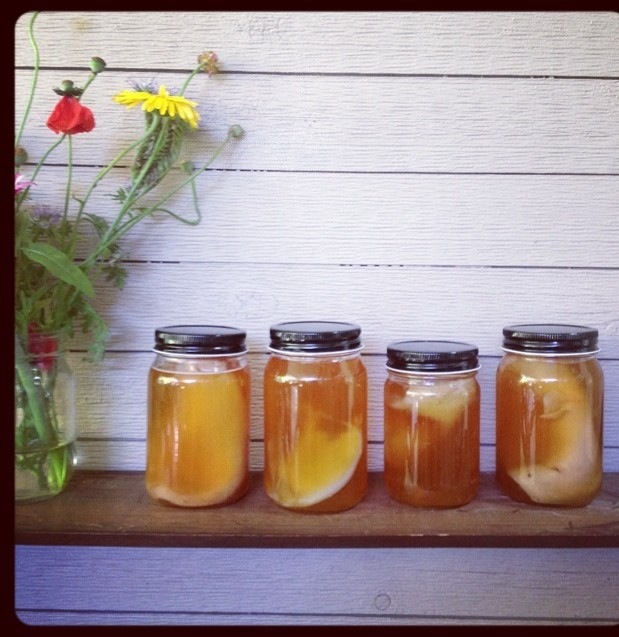 Kombucha is good for gut health and full of healthy probiotics. Plus it just tastes good. Everyone in our family loves it, and we flavour ours with small amounts of organic juice. We’ve tried other things like ginger, spices, lemongrass, and while they are yummy, we stick with what we like best and that seems to be organic pear, mango and orange juice. I’ve been making a batch weekly for almost a year now, and every time I make a new batch, a new scoby grows so I’m constantly giving away scoby’s and starter tea to friends so they can brew their own. I thought it was about time I write up the directions I pass along so anyone can have access to them. Here’s what I do, step by step. Bring one gallon of water to a boil. Turn off the heat and add 1 cup of organic sugar. The kind I have found to work the best is the organic sugar from Superstore that comes in the milk carton. Stir to dissolve. Add 2 tbsp of plain organic loose black tea (we use assam tea). I’ve found that it’s cheaper and you create less waste when you buy loose tea in bulk, rather than use tea bags. If you are using tea bags, use 8 of them per batch. Let it cool completely. The delicate scoby doesn’t like warm tea. Once it’s cooled, put a strainer over your giant jar** and pour your cooled and sweetened tea into the jar, straining the tea leaves out. Now add approximately 2 cups of starter tea that you’ve gotten from a friend to your sweetened and cooled tea. With clean hands, pick up the scoby you’ve also gotten from a friend, and gently drop it into the giant jar. Next put two paper towels on top of the jar and secure it with an elastic band to keep out fruit flies. Put the jar aside where it won’t be bumped or bothered, keep it out of sunlight, perhaps in a cupboard. I mark the date it’s ready on a piece of paper and tape it to the jar. I find it’s ready in 7 days. Fast forward 7 days. 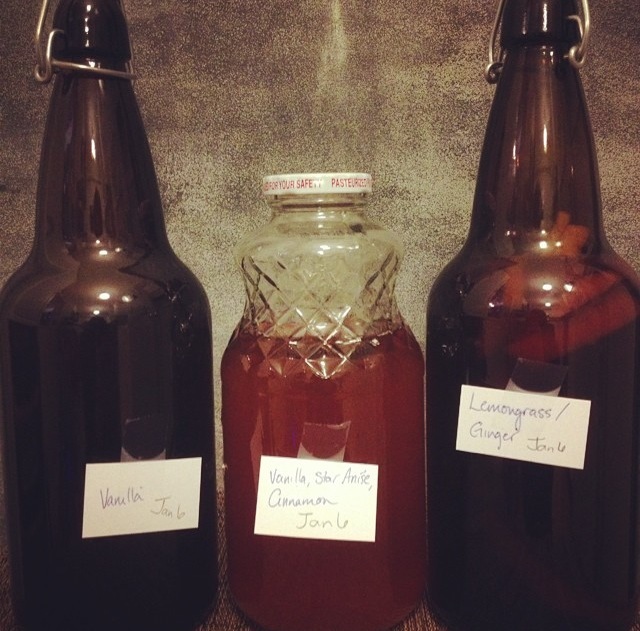 Your kombucha has been quietly brewing for a week. You’ll want to get the next batch going. So, you’ll start from step one again, boil your water, add your sugar and tea, and let cool. Next you’ll want to prepare the bottles for the second ferment (when it carbonates even more and I add juice/flavour). I know there will be approx 10-12 cups of kombucha so I prepare my bottles (it will depend on the size of bottles). I’ve now just started making 3 x 1L bottles of kombucha, but it will depend on what bottles you have on hand. 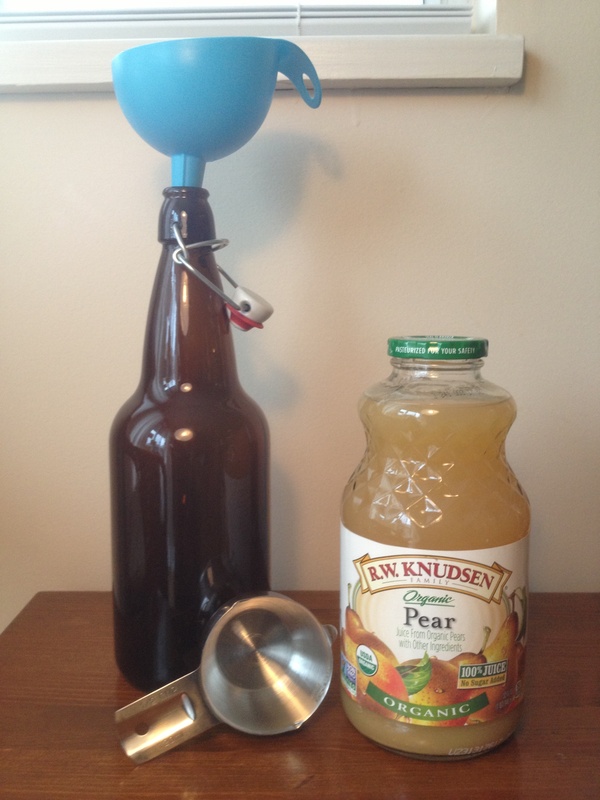 I use a funnel and add the juice to the bottles. 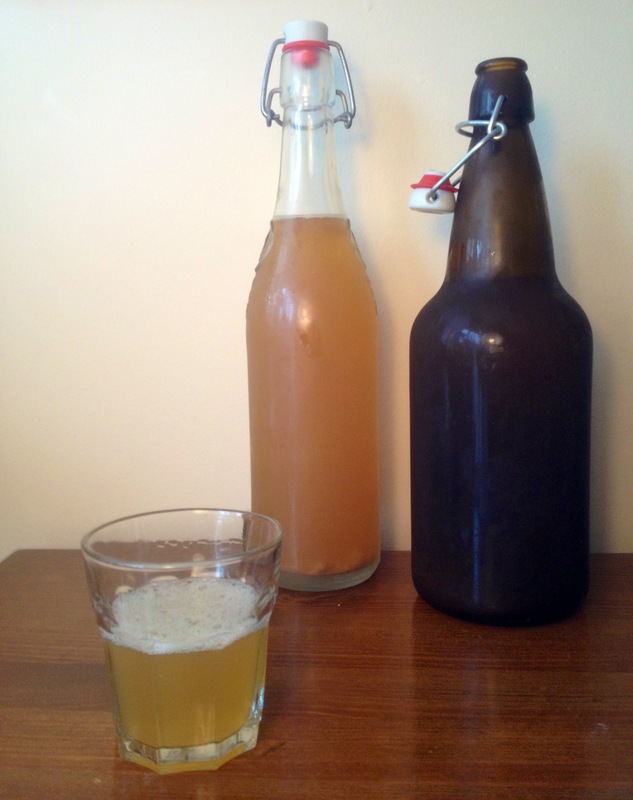 Once your tea has cooled down, take your kombucha that has been sitting for a week. With clean hands, remove the scoby and put it on a plate (not in a metal bowl – scoby’s don’t like metal). Pour 2 cups of the fermented kombucha (from your giant jar) through a strainer and put it aside for the next batch. Then just pour the fermented kombucha into the prepared bottles. I find it makes less mess if I first strain and pour the kombucha from my giant jar, into a 4 cup glass measuring cup, then pour that into my prepared bottles (that you’ve already added juice or flavouring to). Leave 1-2″ at the top to allow for carbonation. Once they are all filled close them tightly and put them in a cool dry place for 24-48 hours. After 24 hours put them in the fridge and they can stay a month apparently (I label the bottles with the date and flavour). Okay, now that you’ve got one batch bottled, you’re onto your next batch. Clean out your giant glass jar, and pour your two cups of reserved kombucha in the jar. Strain the sweetened tea you made that day into the same jar. 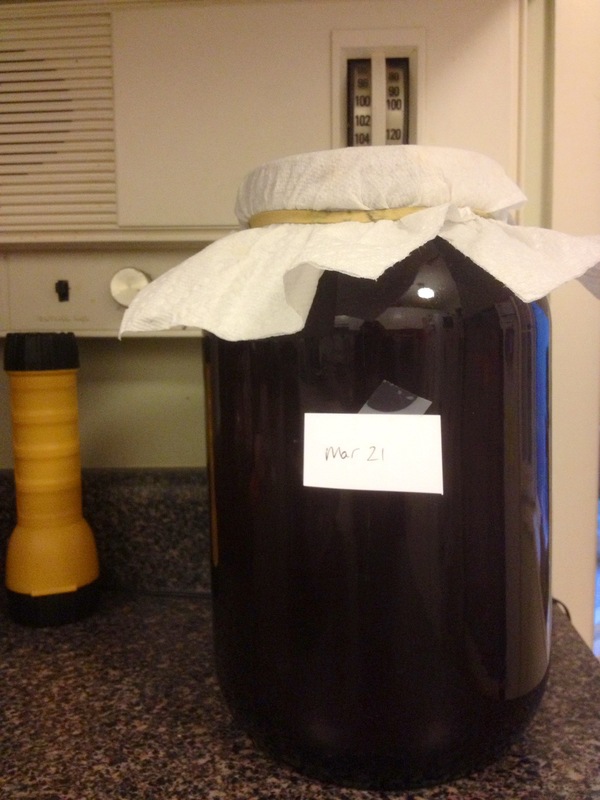 Slip the scoby on top, cover with paper towel, and wait for a week. Repeat, repeat repeat. I’ve tried lots of juices, but our favourites are pear nectar, mango/orange and pomegranate/blueberry. There are a lot of good organic juices you can buy. I hate waste and don’t give our girls juice to drink, so what I’ll do is freeze the remaining juice into 1/2 cup portions ahead of time and keep it in the freezer in a labelled bag. It sounds complicated but it’s really not, and if you like kombucha it’s totally worth it. Reuse the glass juice bottles for your finished kombucha, or large 1L mason jars also work well. **You can buy 1 gallon mason jars from Target or just get them for free from your local grocery store. If they have an olive bar, they’ll have large glass bottles they recycle anyways, so just ask for one!